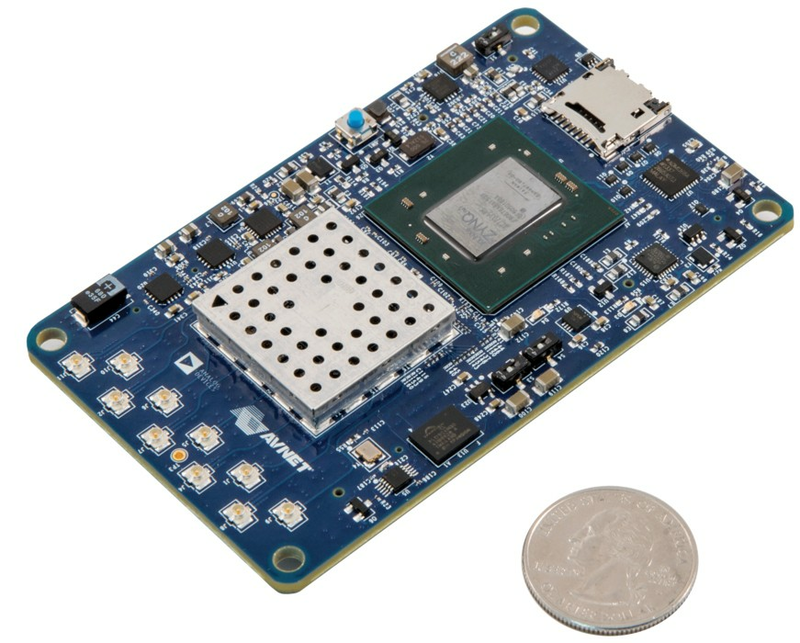 Avnet, Inc. (NYSE: AVT), a leading global technology distributor, today introduced the PicoZed™ SDR Z7035/AD9361, a rugged, low-power, small footprint system-on-module (SOM) that integrates critical RF signal path and high-speed programmable logic, enabling designers to dramatically reduce cycle times for development of the RF-to-baseband signal processing core for wireless communications systems. The fully verified PicoZed Software-Defined Radio SOM provides frequency-agile wideband 2x2 receive and transmit paths in the 70 MHz to 6.0 GHz range, making it suitable for both fixed and mobile SDR applications. Click here for a short video demonstration of the new PicoZed™ SDR Z7035/AD9361. The PicoZed™ SDR Z7035/AD9361 SOM, which combines the Analog Devices AD9361 integrated RF Agile Transceiver™ with the Xilinx Zynq®-7000 Z-7035All Programmable SoC, is supported by robust simulation and code generation tools that integrate seamlessly with Xilinx Vivado® Design Suite. For fast prototyping of software-defined radio products, Avnet offers the PicoZed™ SDR Development Kit, which bundles everything required to kick start a software-defined radio (SDR) design, including the PicoZed SDR Z7035/AD9361 SOM, a carrier card for prototyping with standard high bandwidth interfaces like USB, Dual Gigabit Ethernet, Small Form Factor Pluggable/Common Public Radio Interface and RF power modules. Fast data exchange with MATLAB® and Simulink® is supported for system design and test, along with hardware/software codesign workflows for system deployment. Pre-orders for both the PicoZed SDR Z7035/AD9361 SOM and PicoZed™ SDR Development kit are being accepted now, and will be fulfilled later this month. To help wireless system designers maximize the potential of PicoZed SDR, Avnet will offer a series of software-defined radio SpeedWay Design Workshops™ in collaboration with Analog Devices, MathWorks and Xilinx starting in November 2015. The PicoZed SDR Z7035/AD9361 system-on-module (SOM) is available for order today from Avnet Electronics Marketing for $1,095. The PicoZed SDR Development Kit is offered at $1,799 and the PicoZed SDR FMC Carrier Card is $595. For further information on the PicoZed SDR SOM and Carrier Card, go to www.picozed.com/sdr.